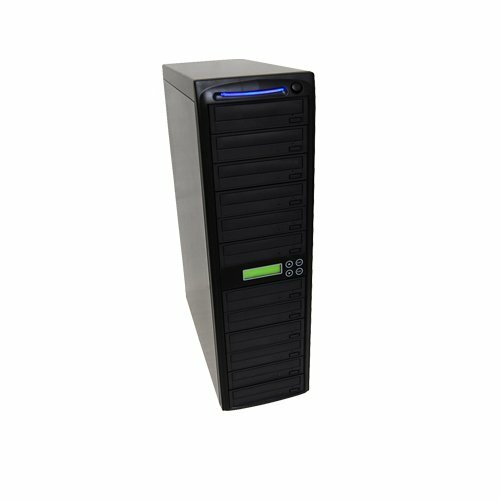 The 10DVD daisy chain duplicator offers optical disc burning technology suitable for anyone involved in disc duplication. The user-friendly LCD interface provides a simple one-step copy function that burns your CD and DVD blank discs at an optimal speed producing a maximum of 20 copies every burn cycle. Burning speeds are adjustable and other standard menu features are available for advanced users. A computer is not required at all for this standalone duplication system. All inside the copy tower itself, different CD and DVD formats are automatically detected to allow stable and secure buffer under run protected burning without the added trouble or stress from a computer to handle such functions. Ensuring a fast, cost effective solution for duplication runs whether burning is performed at home, office, or studio, benefit from high volume disc output and reliable performance from the 20DVD. A complete standalone DVD Duplicator with a 128mb buffer speed and the latest 24X burners. Intelligently designed to automatically recognizes the source disc format. Upgradeable system firmware. Burning Speed: For CD 2-4 Minutes, For DVD 5-8 Minutes. Does not copy protected disc (Rented disc or Store bought disc).